^ Winchester, Simon (2003). Extreme Earth. Collins. pp. 168-169. 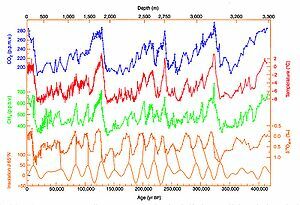 ^ Deciphering Mysteries of Past Climate From Antarctic Ice Cores Earth in Space, Vol. 8, No. 3, November 1995, p. 9. © 1995 American Geophysical Union. Retrieved 2007-03-27. 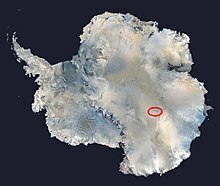 ^ Vostok Ice Core Datawww.ncdc.noaa.gov, 2005-12-22. Retrieved 2007-03-27. ^ Dominique Raynaud, Jean-Marc Barnola, Roland Souchez, Reginald Lorrain, Jean-Robert Petit, Paul Duval and Vladimir Y. Lipenkov. (2005). "Palaeoclimatology: The record for marine isotopic stage 11". Nature 436: 39–40.